Looking at some past photos of stuff we've made, I discovered this one. I don't even remember with what we served this. JS just happened to make some random dish from Pei Mei's Chinese Cook Book Volume I.
JS and I were walking aimlessly in Taipei 101 when we saw an English-language bookstore. Finally, a store we can patronize. Browsing its cookery shelves, we were ecstatic to find Pei Mei cookbooks in English! We snapped up Volumes 1 to 3 of this series, plus 2 volumes of her Homestyle Cooking books. Granted, this isn't a very snazzy introduction to her cookbooks, but at least we can enter this into Wandering Chopsticks' Weekend Wokking event. Note: This may be kept for 1 week in the refrigerator. 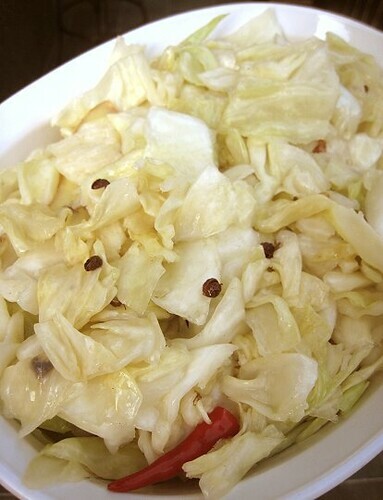 Rince and cut the cabbage into shreds about 4 cm long. Put into a bowl, sprinkle with salt, mix and let sit for about 1-2 hours. Squeeze out the salty water from the cabbage. 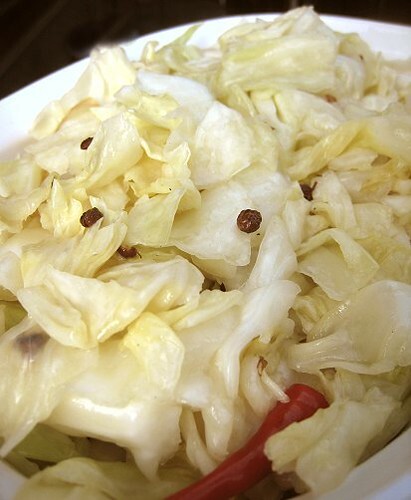 Place cabbage into bowl and add the red chili shreds and ginger shreds. Heat sesame oil in a pan, add the Szechuan peppercorns, and cook until they are fragrant and turn darker in color. Add sugar and vinegar, and bring to a boil. Pour this mixture over the cabbage and mix well. Cover with a lid, and let sit for about 1-2 hours, until the cabbage absorbs the flavors. 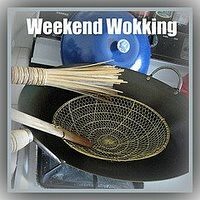 Thank you for sharing this recipe with Weekend Wokking. I think Pei Mei's cookbooks are a treasure for us homecooks, most everything turns out. You're lucky to have three volumes, as the last time checked they had been out of print for a while..... They didn't call her the Julia Chils of Taiwan for nothing! I don't think I ever tried Beijing style. We were really happy when we saw those English versions! It was PageOne bookstore, inside Taipei 101. Thanks for posting this! I used to love this salad when I lived in Beijing, and I couldn't find the recipe anywhere. I'm going to have to check out the cookbook.